Firefox 53. The new version of Mozilla’s Firefox has important tweaks under the hood and a svelter interface. Competition in tech is good for consumers, so I’m glad to see Mozilla pumping up its Firefox browser as it struggles to keep from being buried by Google Chrome. Firefox 53, released Tuesday has a number of important tweaks, including changes to its architecture which Mozilla claims will reduce crashes by a solid 10 percent. The new Firefox, which you can download here, also contains a number of visual tweaks, including more readable tabs and a theme for reading in low light without straining your eyeballs. I’ve been a Firefox user for years, but Chrome has long since grabbed a much larger share of the browser market, making it all the more important for Mozilla to keep the innovations flowing. The changes under the hood that make Firefox more stable are the first fruits of what Mozilla calls Project Quantum, a long-term effort to improve the browser launched last year. According to Mozilla, the new code in Firefox 53, called a quantum compositor, will work for about 70 percent of Firefox users – those on Windows 10, 8, and 7 with the Platform Update, on computers with graphics cards from Intel, NVidia or AMD. There is one group that won’t be able to take advantage of the improvements – users still running the long-in-the-tooth Windows XP and Windows Vista, a policy Mozilla announced last year. Dropping support for older version of Windows can be wrenching for some, but it allows developers to lop off superfluous chunks of code, which makes the browser a bit lighter on its feet. Mozilla has added two themes to Firefox: Compact Light and Compact Dark. Both shrink, or make more compact, some features on the interface to give you a bit more room. The Compact Dark theme inverts colors so it won’t strain your eyes, especially if you’re browsing in the dark. To turn on one of these themes, click the menu button and choose Add-ons. Then select the Appearance panel, and the theme you’d like to activate. There’s also a tweak to the privacy settings. 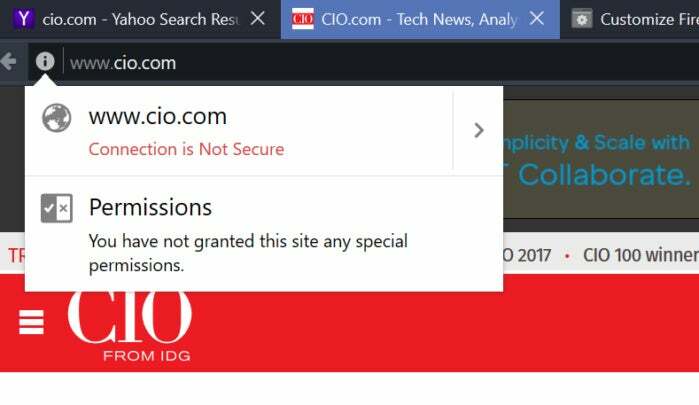 As Mozilla explains: “When you visit a website that wants to access sensitive hardware or send you a notification, you’ll be prompted with a dialog box that explicitly highlights the permissions that site is requesting. If later on you would like to change a site’s permissions, just click the ‘i’ icon in the Awesome Bar,” the annoyingly twee name Mozilla uses for the address bar. Changing site permissions in Firefox 53 is easy. Having said that, the changes probably aren't enough to merit abandoning Chrome or Opera, which is rapidly gaining some popularity. (Microsoft's Edge is still not ready for prime time, though it is improving.) But if you're a dedicated Firefox user, the latest version should remove the temptation to switch.